The University of Michigan thrives because of its ability to bring together best-in-their-fields faculty members and students from all backgrounds with an insatiable thirst for knowledge. The General Fund budget for the University of Michigan-Ann Arbor reflects these priorities with a fiscally disciplined approach to bringing these educators and students together in the world-class learning environment of the Ann Arbor campus. The Fiscal Year 2015 General Fund budget recommendation presented here seeks to leverage the state’s investment in higher education and the university’s ongoing cost-containment efforts to enhance academic excellence. It also is designed to improve student access through significant additional investments in financial aid and holding the in-state undergraduate tuition increase to less than the rate of inflation. This budget proposal allows the university to attract and retain esteemed faculty members like Anne Leslie Curzan and Daniel J. Klionsky. Curzan is an Arthur F. Thurnau Professor of English Language and Literature, professor of linguistics and professor of education who has amassed an impressive record of scholarship, teaching and service since joining the U-M faculty in 2002. In the classroom she is the type of professor who can effect change on the way her discipline is taught and impact how society thinks about language. She has taken her teaching to the masses through her weekly program on language, “That’s What They Say,” on Michigan Radio. She has received international acclaim for her research and is considered an expert on the history of the English language. Her 2014 book, “Fixing English,” explores the continuing role of prescriptivism in the history of the English language. Her earlier textbook, “How English Works,” has had a transformative effect on teaching English linguistics. It is now in its third edition. Klionsky is the Alexander G. Ruthven Professor of Life Sciences, professor of molecular, cellular and developmental biology and professor of biological chemistry. Since joining the U-M faculty in 2000, he has earned national recognition and important grant support from both the National Science Foundation and the Howard Hughes Medical Institute for his research and his transformative approach to teaching. His research focuses on autophagy in yeast cells, which has relevance to cancer, Parkinson’s Disease, Alzheimer’s Disease and cardiomyopathy, an enlargement of the heart. He has been widely recognized for his commitment to “active learning” in his introductory biology classes where he has replaced the traditional textbooks and lectures with lecture notes meant to be read before class, daily quizzes, animated group discussions and increased two-way communication with the professor. The same budget recommendation, with its significant increase in undergraduate financial aid, allows us to attract students like Kyle Murphy and Christopher Reynolds. Murphy will be a senior in the fall majoring in philosophy. He says financial aid was key to his ability to attend U-M as a transfer student from Schoolcraft Community College. “The University of Michigan has been very good to me,” says the student from Livonia who also is working full time in Ann Arbor this summer. His financial aid package of U-M grant aid, a Pell Grant and what he calls a “manageable” student loan has allowed him to pursue his goal of attaining a U-M education. Reynolds, who grew up in a suburb of Philadelphia almost did not apply to U-M, even though he was attracted by the top-notch engineering program. He didn’t think he could afford the out-of-state tuition. A U-M grant combined with local scholarships got him through his freshman year. Then he won an engineering scholarship and feels confident he will achieve his goal of being the first in his family to graduate from college. He will begin his junior year this fall studying aerospace engineering. What would he tell others intimidated by college costs? “Just apply. You never know what will happen.” He has an internship in Ohio this summer. These examples also sharpen the focus on the key elements of the General Fund budget recommendation. It is a budget built upon maintaining and enhancing the academic excellence of the University of Michigan and providing wide access for students to the broad array of educational opportunities on the Ann Arbor campus. It is a budget recommendation that puts a fine point on academic excellence by reallocating financial resources toward new academic initiatives, making strategic investments to hire 60-80 additional faculty members in order to be able to reduce class sizes and providing the resources necessary to offer modest salary increases for faculty and staff. It is a budget that fulfills the university’s commitment to access and affordability with a 17 percent increase in undergraduate financial aid. That $19.5 million boost is enough to completely cover the increased cost of attendance for most students with need. We are particularly pleased that we will be able to lower the loan portion – by $1,000 – of the financial aid package for most Michigan families in the middle-income range of about $60,000-$120,000 per year. And we will be able to more than double the number of out-of-state students receiving financial aid packages that meet full need. This would be the eighth year out of the last nine that overall financial aid would increase by more than 10 percent. It is a budget that extends the university’s decade-long commitment to fiscal discipline by trimming an additional $24 million in recurring expenses from the General Fund through a continued focus on operational efficiency, cost-containment and seeking alternative sources of revenue. Since 2004, $289 million in recurring expenses has been trimmed from the General Fund budget, allowing resources to be reallocated to higher priorities and constraining tuition increases. Revenue to the General Fund comes from three main sources: Tuition, state appropriation, and indirect cost recovery on sponsored research. Indirect cost recovery pays specifically for the indirect costs of research making this funding not available for allocation on a discretionary basis. This leaves tuition dollars and the state appropriation as the primary General Fund revenue sources that can be flexibly allocated. The revenue to pay for these priorities in FY2015 would come mainly from increases in revenue associated with tuition and fees and an increase in the state appropriation. 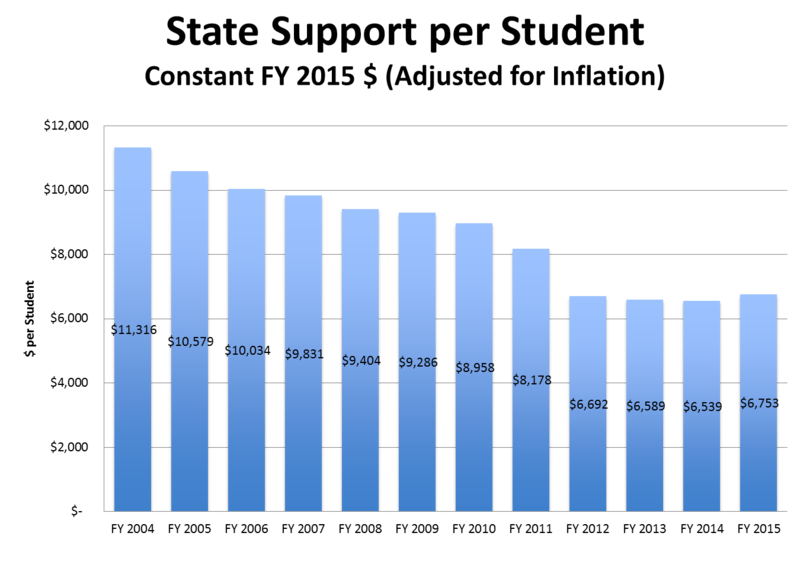 The budgeted increase in tuition and fee revenue reflects changes in enrollment relative to budget plus the effect of the proposed tuition rate increases and a slight projected increase in the proportion of out-of-state students. The incremental revenue associated with the university unions and recreational sports facility improvement fee also is included. These revenue increases, coupled with cost-cutting efforts totaling $24 million, make up the overall General Fund budget recommendation of $1.8 billion (See Table 1). Maintaining and improving the educational experience for students is the overarching priority reflected in the General Fund budget recommendation for the Ann Arbor campus. New academic programs: Technology is advancing at a dizzying pace and one area gaining a lot of attention is the field of robotics. Beginning in the fall, the College of Engineering will offer interdisciplinary MS and Ph.D. programs in robotics to bring together the many disciplines that contribute to research in this exciting field. This new program will integrate knowledge from the fields of mechanical engineering, computer science, artificial intelligence and biomedical engineering for applications specific to robotics. A specialized introductory class will offer students a hands-on experience with robots. Enhancement of the student experience: Two initiatives highlight the ways in which we are leveraging technology to enhance the learning experience for students on the Ann Arbor campus. One is at the U-M Library where the preservation of data and digital archiving is growing exponentially. Yet the library is looking well beyond just storing data toward an effort to help scholars and students actually “see” what the data are telling them. This data visualization process will play a critical role in communicating complex concepts and supporting the interpretation of large volumes of data generated by the creation of new knowledge. A second project will take place within LSA, where there is a program to take 26 small classrooms and turn them into what are commonly called “laptop classrooms” by better equipping them with wireless projection capabilities. This allows every laptop-equipped professor and student to be able to present seamlessly to the entire class. Having current faculty, staff and students visit high schools and colleges to establish relationships with schools with significant numbers of underrepresented minority students. Establishing a mentorship program for underrepresented students. Establishing a speaker series to highlight intellectual diversity. Expansion of international opportunities: Many schools and colleges are expanding their international profiles through study abroad programs, collaborative research opportunities and faculty exchange programs. At the College of Engineering, student participation in the International Programs in Engineering has doubled over the past five years as the school works toward a goal of providing an international experience to every student. One way this is done is through student design teams that are focused on such projects as harnessing wind energy in El Salvador and harvesting and filtering rainwater in Nicaragua. Because of our multi-year approach to budget forecasting, the university was able to recognize and begin to respond very early to the looming state and regional economic crisis of the mid-2000s. This early warning allowed the university to start the ongoing process of cost containment and cost avoidance earlier than many other institutions. Since FY2004, we have reduced or avoided recurring General Fund expenditures totaling $289 million. An additional $24 million is planned for FY 2015. 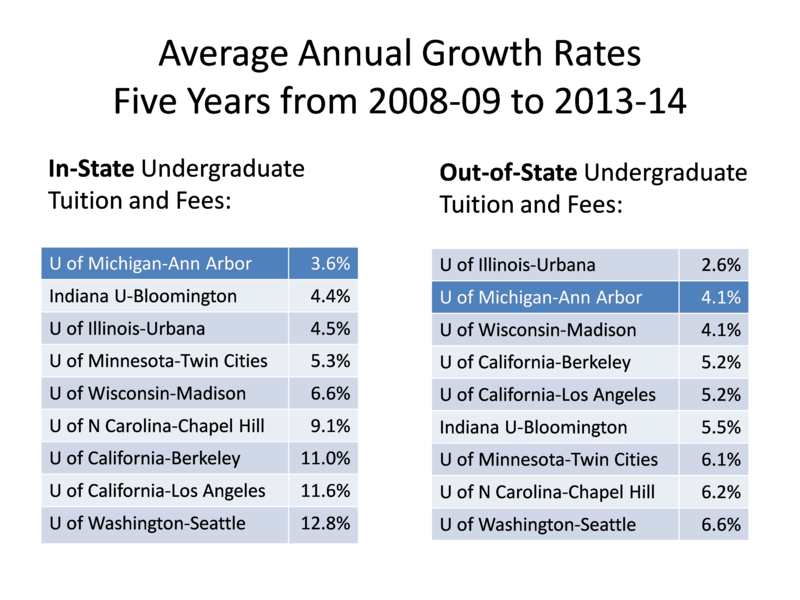 By remaining relentlessly focused on strategic cost containment, the university has been able to avoid program cuts and still keep tuition increases low during a time of declining state financial support and one of the most difficult economic periods for the state of Michigan. Historically, we have achieved this by focusing on seven key areas: purchasing, energy efficiency, health benefits strategies, leveraging information technology, other revenue sources, greater productivity of staff and more efficient utilization of space and facilities. We will continue to look for additional saving in these areas as we broaden the search for savings. Schools and colleges are actively reviewing their teaching loads and course assignments to ensure that they remain focused on high-demand classes, avoiding the cost of offering classes with little demand. As we continue to experience success in the Victors for Michigan campaign, schools and colleges are shifting costs off the general fund to expendable gift funds as those resources become available. Both academic and central administrative units are reorganizing how tasks are handled by strategically eliminating low-priority work and increasing the number of people reporting to a single supervisor. Information Technology Services will continue to roll out the cost-saving MiWorkspace managed desktop services and server support to a set of pilot academic units, building on this year’s initial success in central administrative units. The Administrative Shared Services Center, which will handle specific financial and human resources functions for a variety of units across campus, will become fully operational in FY2015. The first phase of work to be performed in the new center will include accounts payable and accounts receivable transactions. One of the key aspects of the General Fund budget recommendation is our continued emphasis on keeping the university accessible to all students through a comprehensive program of financial aid. This budget recommendation puts special emphasis on reducing the loan burden in financial aid packages for middle-class, state-resident families. 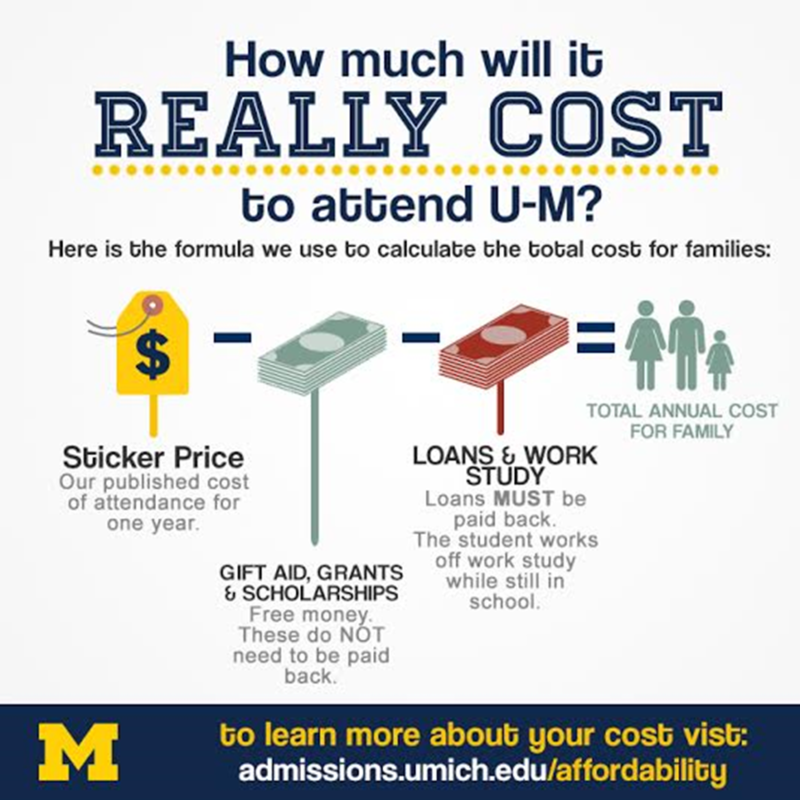 Because of the university’s unwavering commitment to provide financial aid, we can once again report that for most students with financial need, there will be no increase in the net cost of attending U-M in the coming year. That’s six consecutive years. We are able to make that commitment because of a 5.8 percent increase in the state appropriation and modest increases in tuition rates. University grant aid – which does not need to be repaid – will more than cover the total increase in the cost of attendance for students with need. Across all family income bands up to approximately $140,000 a year, there will be increased aid to cover the modest increase in the cost of attendance for students with need. And we are particularly pleased that we will be able lower the loan portion – by $1,000 – of the financial aid package for most Michigan families in the middle-income range of about $60,000-$120,000 year. We also are increasing financial aid for out-of-state students. With approval of this budget recommendation we will be able to meet full demonstrated financial need for out-of-state students from families with incomes of up to about $60,000 a year. That shift will include more than twice the number of out-of-state students receiving aid packages that cover the full demonstrated need. 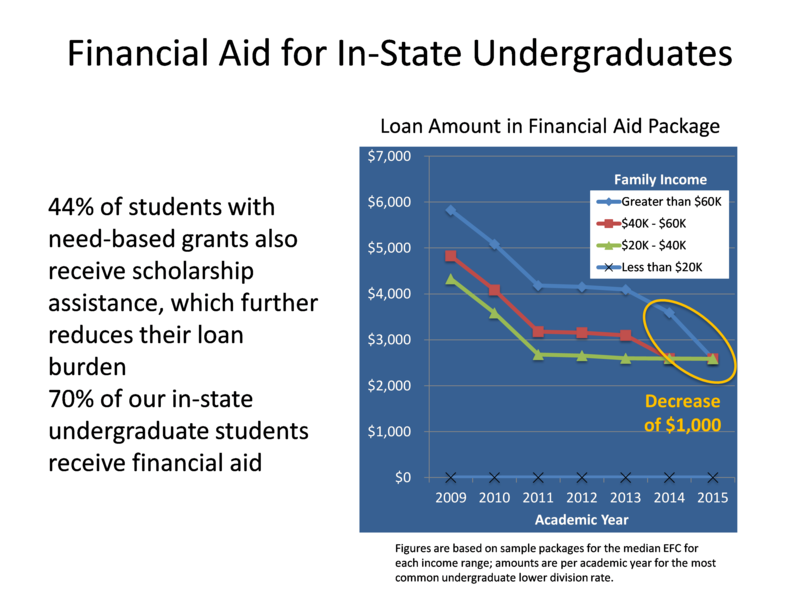 Overall undergraduate, need-based financial aid will increase by $19.5 million – 17 percent – to a total of $133.3 million. If adopted the FY2015 budget would represent the eighth year out of the last nine that financial aid has increased by more than 10 percent – roughly double the average rate for tuition increases during that same period. Additionally it is important to note that beginning in FY2015 students also will be levied a $65-per-term fee that will fund improvements in the university unions and recreational sports facilities. This fee, widely supported by students, was approved in April 2013. Lastly, the Vice President for Student Life is recommending a $2 increase in the student fee that supports Central Student Government activities.